Man United crashed out of the competition following a 2-1 defeat to Sevilla at Old Trafford. ROMELU LUKAKU HAS moved to clarify his comment about some Manchester United players ‘hiding,’ following their Champions League exit on Tuesday night. 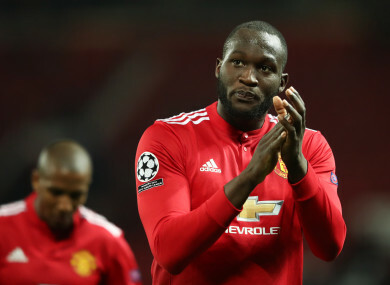 Lukaku made the comment in a post-match interview, which was interpreted by many as a criticism of some of the players’ attitude during the game. United suffered a 2-1 defeat to Sevilla in their second leg clash at Old Trafford, which sent them crashing out of the European competition. Wissam Ben Yedder struck twice in the second half to send the Spanish side into the quarter-finals for the first time in 60 years, with Lukaku hitting one back for the hosts in the closing minutes. A BT Sport reporter was speaking to Lukaku after the game when he said ‘you’ve had the inquest inside the dressing room’ as part of a general question about the forward’s opinion of his side’s performance. The comment however, drew criticism for him appearing to question the application of his teammates during the tie, but he has since further clarified what he meant on social media. “Never will I criticise my teammates! Hiding your face when you’re upset in the dressing room is normal… The result is terrible but we’re Manchester United, we will bounce back for sure with your support! Email “Lukaku clarifies 'hiding' teammates comment following Champions League exit”. Feedback on “Lukaku clarifies 'hiding' teammates comment following Champions League exit”.